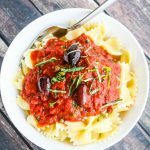 Pasta Al Pomodoro is an easy homemade pasta sauce that is very kid-friendly. Now that my boys are done with school, there will be days when I will be making an extra meal, namely lunch. 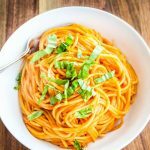 Although it might be easier just to make a sandwich, pasta with a simple spaghetti sauce takes just a little bit more effort, and can turn lunch into a special meal. My oldest son is headed off to college in the fall, and I have been savoring the time he has left at home before we drop him off at the campus footsteps. I have been especially mindful of the meals I’ve been preparing for him, trying to make his favorite foods as much as possible before he leaves, hoping that he will hold fond memories of home-cooked meals, and want to return home on breaks and holidays. 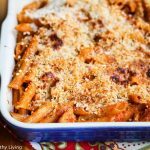 I made a few adjustments to the recipe: I used whole grain pasta and left out the butter. In addition, I found the cooking times to be a bit long for sauteeing the onion and garlic. I also needed to add more pasta water to the sauce to obtain a looser consistency, so I’ve included these adjustments in the recipe below. 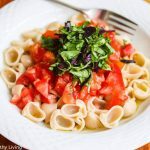 Needless to say, my boys were pleasantly surprised to be presented a beautiful, bright bowl of this Pasta Al Pomodoro for lunch. In fact, my oldest son requested the rest as an afternoon snack! When they asked where I got the recipe, I simply showed them the front cover of Bon Appetit. Heat olive oil in a large skillet over medium low heat. Add onion and cook until soft and translucent, stirring occasionally, about 6-7 minutes. Add garlic and crushed red pepper flakes, and cook another minute. Increase heat to medium, and add pureed tomatoes. Season lightly with salt. Cook, stirring occasionally, until sauce thickens slightly and the flavors meld, about 20 minutes. Remove pan from heat and stir in basil sprigs. Meanwhile, cook spaghetti until about 2 minutes before tender (if the box says al dente takes 7 minutes to cook, then cook the pasta only 5 minutes). Reserve 1 cup of pasta cooking water. Drain pasta. Discard basil from tomato sauce and heat skillet over medium heat. Stir in 1/2 cup reserved pasta water to loosen sauce; bring to a boil. Add pasta and cook, stirring, until sauce coats pasta and pasta is al dente, about 2 minutes. Add more pasta water if sauce seems too thick. Remove pan from heat; add Parmesan cheese and toss. What a great bowl of pasta. I hope you have many wonderful moments with your son before he leaves! I've been moved out of the house for 6 years and I miss my mama's cooking EVERY DAY! I'm sure your son will look forward to coming home whenever he gets a chance. 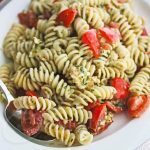 I love a big comforting bowl of pasta and this looks amazing. Yummy! 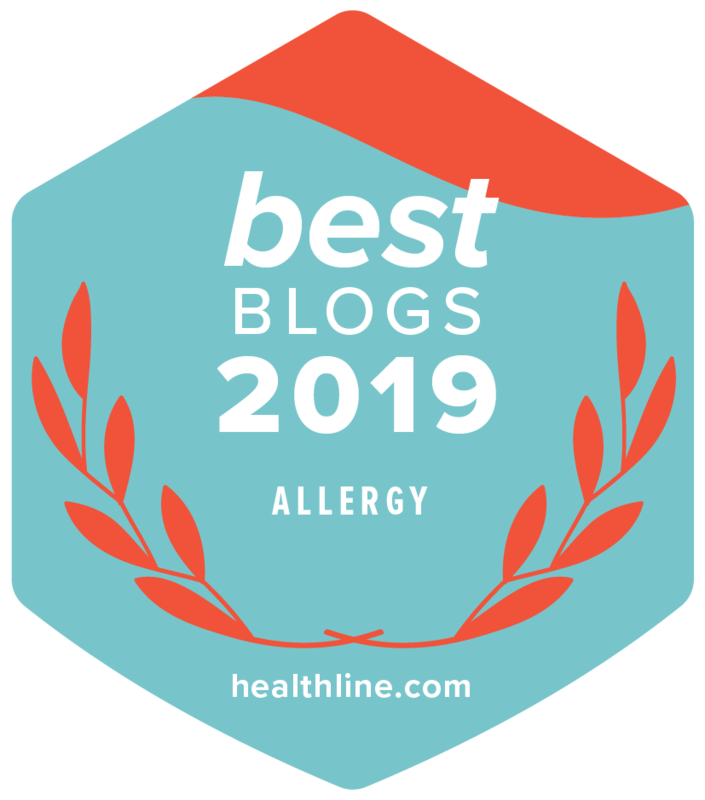 What a wonderful recipe – my girls are also done with school now – I'm trying to commit once more to a more healthy diet for all of us – your blog certainly is an inspiration for this! Jeanette, that is so sweet how you are indulging your son before he leaves for *gasp* college. Sounds like exciting but tough times. I am certain he will miss you and your amazing cooking bunches 🙂 This pasta looks amazing. 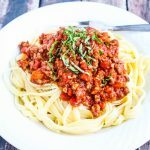 This is such an easy sauce to make, that I'm planning on making it again for lunch or dinner soon for the boys! Looks super good, sadly my 14 year old daughter wants her KD (you call it kraft macaroni and cheese there). She loves that stuff. I wish she liked something better for her. Big sigh here. How nice! I can't believe you have a son going off to college, but then I can't believe I'm going to be a grandma this summer either! 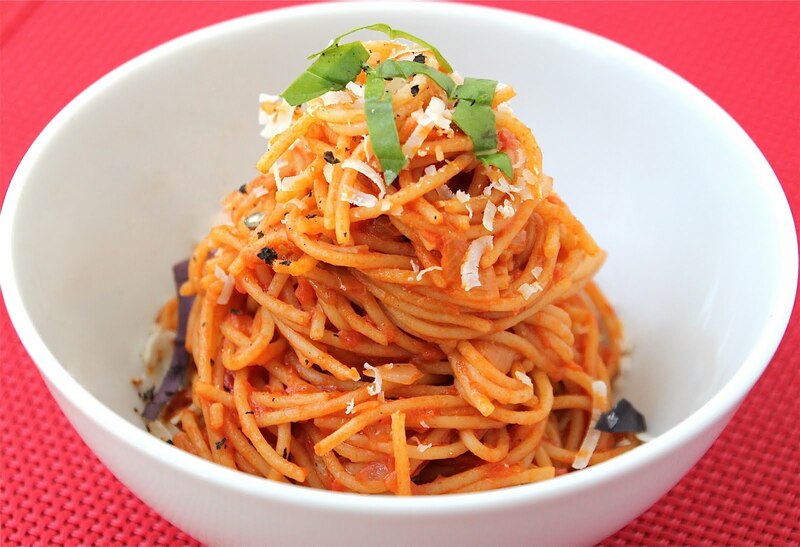 i love pasta with marinara sauce. yum! i bookmarked this recipe hehe. and you have a third son, one going to college?! i'm so confused!!! 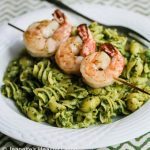 This is a nice easy recipe to have on hand – it uses pantry staples so it can thrown together last minute. 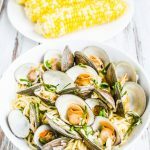 I have four boys who all love to eat (my oldest is headed off to college), so in the summer when everyone's home, I try to make simple meals that my boys enjoy. Thanks for sharing a great recipe & story with Presto Pasta Nights. Just wanted to let you know this has become our regular pasta sauce! So glad I found this. Thanks! How long do you think you can keep a homemade sauce like this in the fridge? The sauce should keep in the fridge for a week. You can also freeze it. 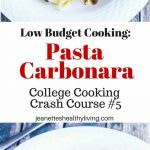 Just tried this recipe last night and it was amazing! My family really enjoyed it, especially my 6yr old who had two servings. I bought 2- 14oz cans of diced tomatoes with basil and garlic that I found at Ralphs store and skipped the processor. Also used chicken bouillon instead of salt and followed the cooking instructions. 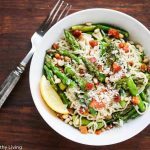 I served it topped with grated parmesan and chopped basil, with a side of rotisserie chicken…so simple and delicious! 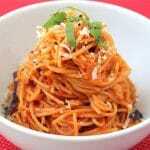 It’s a must try, definitely going to make this instead of regular spaghetti which my family refuses to eat anyway. Thank you for the wonderful recipe! Hi Bebe, so glad you tried this recipe and that your family enjoyed it so much! Love how you switched things up!